This Queue Management set includes two Luxury Flat Top Stanchions and one Stanchion Rope. 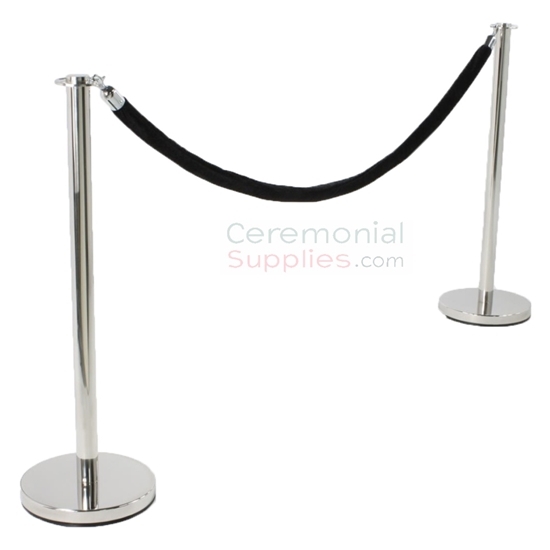 Stanchion posts are made from stainless steel with a shiny Chrome finish and go well with the rich velvet stanchion rope that has matching chrome hooks on both ends. For venues and events such as museums, and theaters, and galas, this set of Chrome Stanchions and Rope effectively manages the crowd, increasing the safety of the individuals attending as well as the hosts themselves. The rope comes in color options of Classic Velvet Red, Royal Blue, and Sleek Black. Either one of these colors, paired with the Chrome Flat Top Stanchions, will definitely enhance the luxuriousness of your venue.